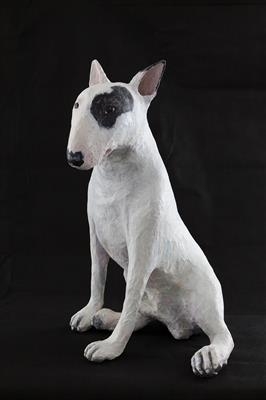 Life size English Bull Terrier with distinctive Black eye patch. Made of wire, papier mache, plaster and acrylic paint with matt varnish. I love this dog! 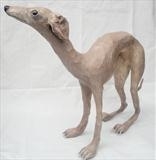 He is inspired by a neighbour's pet who lives by the Grand Union Canal. He is friendly, brilliant with babies and small children and very low maintenance!